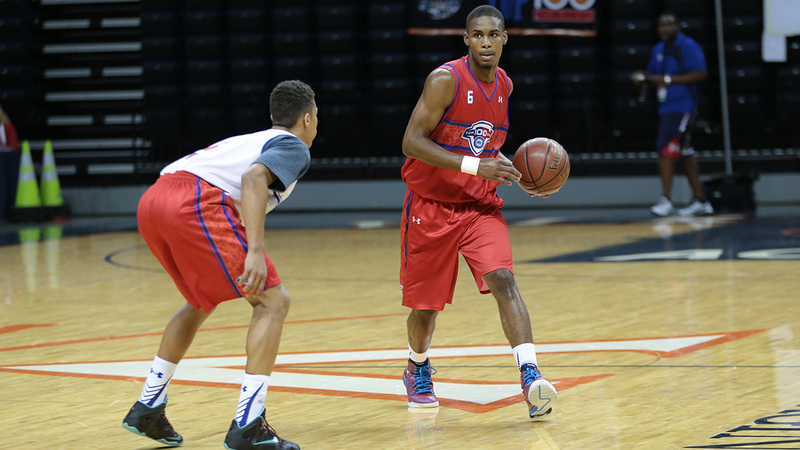 Is high school junior Seventh Woods the next Russell Westbrook? Seventh Woods’s unusual name is derived, his parents say, from the Book of Genesis. “And God blessed the seventh day and made it holy, because on it he rested from all the work of creating that he had done.” It’s a good name, but as I watched Seventh, one of the nation’s best high school basketball players, streak across the court during a game last November, I couldn’t help but think there’s nothing about this incredibly gifted 16-year-old point guard that suggests repose. It was a home game. Seventh, a junior, plays for Hammond, a small private school in Columbia, South Carolina. His team was facing Orangeburg Prep, and from the moment the players formed layup lines it was apparent that a blowout was coming. The Orangeburg players, with the exception of a short, speedy point guard, looked at the floor as they dribbled, as though they were counting their steps to the basket. Meanwhile, Seventh, who stands 6-foot-2,1 and a few of his teammates were one-upping each other with increasingly acrobatic dunks. Seventh came to national prominence as a freshman, when several of his highlight compilations found their way to YouTube. A year later, one of his dunks was named the no. 1 highlight on SportsCenter, beating out a slam by LeBron James. But Seventh isn’t just some And1 leaper. He also was the youngest member of USA Basketball’s under-16 national team in 2013, and he’s already received offers to play for North Carolina, Wichita State, South Carolina, and Clemson — most likely a quick pit stop before the NBA. On the first play of the game, Seventh deflected an Orangeburg Prep pass and converted a contested layup. Less than a minute later, after another steal, he soared high above the rim for a breakaway two-handed dunk. “The first thing I noticed when I watched him play was that his athleticism is over the top,” said Woods’s USA Basketball coach, Don Showalter. By the end of the first eight-minute quarter, Hammond had a 21-6 lead, and Hammond’s coach, Mark McClam, was already subbing in most of his bench players. When Woods returned to the floor, he continued to show flashes of mind-boggling athleticism, particularly on defense, as he leapt into passing lanes and stripped dribblers of the ball. On offense, his point guard instincts took over and he fed his teammates for fast-break dunks and open jump shots en route to a 76-39 drubbing. Seventh told me the NBA player he most tries to emulate is LeBron James, but he more closely resembles Russell Westbrook and the pre-injury Derrick Rose, players whose explosive athleticism has redefined the point guard position. For an athlete of Seventh’s caliber to play for Hammond or any other private school in South Carolina is an anomaly. Traditionally, the state’s private schools have never been sports powerhouses — there are no Oak Hill Academies or DeMathas. The state’s best players tend to come from larger public schools. Denver Nuggets great Alex English graduated from Dreher High School, my own alma mater. Jermaine O’Neal played at Eau Claire. Xavier McDaniel starred at A.C. Flora, though his son, Xavier McDaniel Jr., now plays with Seventh at Hammond. Seventh told me his decision to come to Hammond “had nothing to do with basketball.” Hammond “is one of the best academic schools in South Carolina,” he said. “So that was our main focus.” And for better or worse, a young player’s main showcase today is the Amateur Athletic Union summer circuit, not school games. But until relatively recently, Hammond would have been seen as an odd choice for Seventh or any other African American student. Of Columbia’s private high schools, Hammond is the only one that was born in defiance of integration. It was founded in 1965 by parents who not only wanted to exclude minorities but also bar their own white children from competing athletically against any other school with black players. By the time I was in high school — I graduated from Dreher in 1993 — even though Hammond had officially integrated, it hadn’t shaken its reputation as a place that was inhospitable to nonwhites. So over the past couple years, the more I heard about Seventh’s basketball accomplishments, the more curious I became about the evolution of a school that for so many years wouldn’t have wanted him. This was the thinking that inspired the creation of the James H. Hammond Academy in 1966, as well as other “seg academies” that sprung up in the South after desegregation. Ten years later, journalist John Egerton, on assignment for The New York Times Magazine, visited the school and found that little had changed. A Confederate flag flew at the main entrance to the idyllic, wooded campus. He noted that the school’s sports teams still refused to schedule opponents with black players. Seventh Woods is the youngest of six children. His father, Louis Woods, played high school basketball at C.A. Johnson, a public school that opened in 1949 for black students in the Jim Crow era and whose student body remains overwhelmingly African American. Seventh’s mother, Monica Woods, didn’t play sports. Seventh also excelled at other sports. “He got a lot of rave reviews in baseball,” said Louis Woods, who vividly remembered a coaches-pitch all-star game when Seventh was 10 years old. The Woods family arrived at the ballpark and noticed cars and a concession stand parked just outside the outfield fence. “Why are the cars parked so close to the fence?” Louis Woods recalled thinking. The league director told him that no one in the age group had ever hit a ball out of the park. But that day Seventh’s homer landed on top of the concession stand. “He became a baseball celebrity that night,” Louis Woods said. But in this age of specialization, Seventh’s first love, basketball, soon became a year-round commitment. He began playing AAU by the time he was 9, and two years later he led the SC Ravens to the AAU under-12 national championship. (Here’s 11-year-old Seventh dunking in the title game.) “We only lost one game that entire season,” said Ravens coach Dion Bethea. In one memorable game against the team’s biggest in-state rival, Bethea recalled, Seventh was forced to the bench with early foul trouble. “He’s always been a quiet kid, and that was the first time I really saw him pissed off,” Bethea said. “When he checked back into the game in the second half, he scored 12 straight points.” Seventh was so good at that young age, Bethea said, that he also began playing on the Ravens’ under-17 team. “He showed a lot of maturity on the court and showed that he belonged,” Bethea said. When John Egerton returned to the James H. Hammond Academy campus in 1988, he noticed the Confederate flag was no longer flying at the front gate. More significantly, “about a dozen black students had been enrolled, and others were being sought, with scholarships as an inducement,” he wrote in the book Shades of Gray: Dispatches From the Modern South. The IRS had restored the school’s tax-exempt status. Much of the original board had been replaced, and a new headmaster, New York native Nick Hagerman, hoped to push the school away from its segregationist roots. Meanwhile, the South was changing, albeit slowly at first. In 1965, 11 years after Brown v. Board of Education, the landmark Supreme Court decision that declared “separate but equal” public schools to be unconstitutional, only “one percent of black children were enrolled in integrated public schools” in the South, wrote Zebulon Vance Wilson in They Took Their Stand: The Integration of Southern Private Schools. By the time Hagerman’s successor, Herb Barks, arrived in 1989, the board of directors had decided to change the school’s name from the James H. Hammond Academy to the more opaque Hammond School. Hammond’s team mascot changed from the Rebel to the Skyhawk. Currently, 247 Sports rates him the fifth-best combo guard in the class of 2016, and ESPN has him, arguably out of position, as the eighth-best shooting guard. He’d likely be even higher if a broken wrist last spring hadn’t kept him off the summer AAU circuit. Still, college coaches regularly attend his games. “[University of North Carolina head coach] Roy Williams has been on campus five or six times,” Hammond headmaster Chris Angel told me. Seventh’s USA under-16 coach also praised the young player’s demeanor. Seventh was one of 30 teenagers invited to try out for the squad. “What stood out right away was that his athleticism was over the top,” Showalter said. “But there’s a lot of good athletes out there. What helped Seventh secure his spot was how well he tried to incorporate his own talents into the team concept. A day after destroying a hapless Orangeburg Prep squad, Hammond faced a more formidable opponent in Ridge View, a public high school with more than 2,000 students. Technically, the game was a scrimmage, but Coach McClam treated the contest seriously and was stingy with his substitutions. Seventh scored the first points of the game on a lefty layup, but Ridge View raced to a 7-4 lead. None of the Blazers’ players stood as tall as Hammond’s starting center, 6-foot-9 Chevez Goodwin, and none was as skillful as Seventh. But the Blazers were athletic and physical, controlling the paint for most of the game. A few defensive miscues by the Skyhawks led to a couple of Ridge View corner 3s, and the Blazers extended their lead to 12. Prior to watching Seventh play, it had been a long time since I’d watched a high school game. It wasn’t gorgeous basketball. Turnovers were more common than made buckets. Even after hearing him describe his approach to the game with such maturity, I was surprised how selflessly he played. Lightning quick, with an impressive handle and truly rare leaping ability, it was clear that Seventh could create a shot for himself anytime he liked. But even as his team trailed against Ridge View, he looked to create shots for his teammates. Several Hammond officials, parents, and alumni were reluctant to speak with me about the school’s evolution. Just a minute or so into our phone conversation, for instance, retired headmaster Barks begged off discussing the school’s racial history. “I’ve been retired for a long time and am not comfortable talking about it,” he said, cutting our conversation short. Even today, you don’t have to look hard in South Carolina to find examples of the state’s Jim Crow past. The Confederate flag still flies on the statehouse grounds, facing Columbia’s Main Street. More than a decade ago, I wrote an exposé of the whites-only Forest Lake Country Club, which still, as best as I can determine, has yet to admit a black member. And the University of South Carolina’s state-of-the-art gym, the Strom Thurmond Wellness and Fitness Center, salutes a late politician best known for espousing segregation during his 1948 presidential campaign, and later, as a U.S. senator, for filibustering the 1957 Civil Rights Act. But the more I spoke with those in the Hammond community, the more I came to believe that the school, despite its beginnings, is representative of a larger, positive trend in race relations, which, as recent deadly policing events have demonstrated, remain fraught not only in the South. The school’s evolution on racial issues coincided with the state’s, McDaniel Sr. said, and it made no sense to harbor bad feelings for an institution that had turned away from its ugly past. “Forty years ago, I probably wouldn’t have been allowed to play for Hammond or any other private school here,” he said. In fact, McDaniel began kindergarten at Perrin Thomas, an all-black public elementary school operating as part of the state’s “equalization” program in defiance of integration. It wasn’t until a couple years later, in 1970, thanks to a federal court order and pressure from President Nixon, that South Carolina and six other resistant Southern states ended their dual school systems. Many of the all-black schools shut down, and McDaniel continued his elementary education at A.C. Moore, previously an all-white school. “When you look at my experience and Hammond’s experience, and you look at Seventh, my son, and other kids, it just shows you times have changed,” McDaniel said. On Saturday night, that very same day, Hammond was scheduled to play Spring Valley, the public school where Xavier McDaniel Jr. struggled to find playing time. Spring Valley’s star was senior guard Perry Dozier Jr., who had already committed to playing for the University of South Carolina after receiving offers from Louisville, Michigan, and other prominent programs. Though his thoughts were far from basketball, Seventh elected to play. Hammond was the decided underdog, but early on, it became apparent that the best player on the court would decide the outcome. Seventh soared high above the rim for tomahawk dunks and two-handed slams, and his jumpers swished through the net. Seventh’s teammates rallied around him: McDaniel had 19 points and freshman Lucas Prickett chipped in 17, including five 3-pointers. Dozier didn’t disappoint, leading Spring Valley with 30 points, but it was Seventh’s night. His 37 points led the Skyhawks to a 94-68 blowout that no one saw coming. In the following days, a flurry of emails circulated among Hammond parents, McClam, and school administrators. Seventh’s coach, teammates, and many others affiliated with the school attended his grandparents’ funeral. Ned and Helen Woods’s records were burned in the blaze, and it was unclear if they had home or fire insurance, so a memorial fund was established. A parent forwarded me the correspondence, an outpouring of kindness and concern for Seventh and his family, and any lingering skepticism I felt about the sincerity of the school’s break with its past washed away. The Hammond community takes care of its own. Paul Wachter last wrote for Grantland about the tennis player Ernests Gulbis. Some recruiting sites list Seventh at 6-0 or 6-1, but having stood next to him recently, I can say it seems that he has grown since their latest measurements.